Pebeo presents a creative and fun new craft for kids. 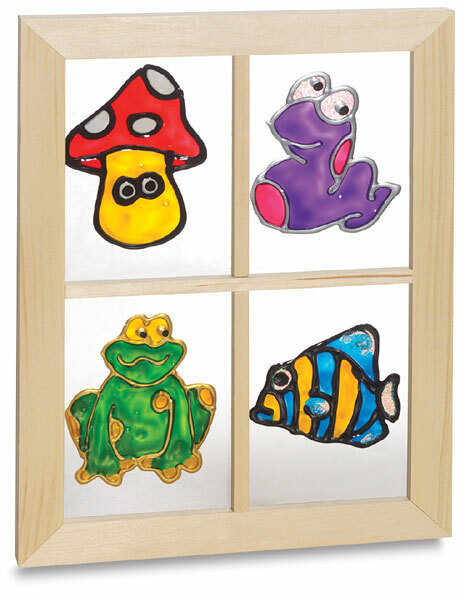 With Arti' Stick Window Colors, children can create their own decorations for windows, mirrors, tiles, plastic and metal objects, and other smooth, non-porous surfaces. Fun for kids can also be serious business for adults. Create advertising messages, announce a sale, or launch a political campaign with an eye-catching window sign. Arti' Stick Window Colors are a great way to display a temporary message on a window or mirror. Attach your message to surfaces where ordinary paints don't stick. Simply pick a pattern, or draw your own pattern, and place a plastic sheet over it. Then start painting with vibrant Arti' Stick colors. Paint directly with the tube — neither a brush nor water are needed. Outliners can be used to trace the pattern. Allow the painting to dry for 24 hours, and then peel it off the plastic. When dry, the colors become vivid and transparent, as if by magic! The design will cling decoratively to the window of your choice. Dry paint designs can be repositioned as often as desired, as long as they are not placed on a porous surface such as paper, cardboard, or wood. A design can easily be cut, allowing you to make colorful puzzles and mosaics. Arti' Stick paints are water based, with a strong film and good lightfastness. Colors can be mixed together. Individual 75 ml (2.5 oz) tubes are available. Replenish your favorite colors, or choose colors individually. Outliner — Use outliners to trace the pattern of your design. We recommend using an outliner before using regular colors to help delineate the design. Both black and gold outliners are available. 75 ml (2.5 oz) tubes.